NEW YORK CITY — This year, the phenomenon known as Asia Week New York — when everyone who is anyone in the world of Asian art and antiques descends on New York City for a whirlwind series of lectures, gallery openings, sales, shows and receptions — celebrated its tenth year. In addition to works on view at six New York City auction houses, as well as auctions conducted more distantly in both Philadelphia and Boston, seven dealers debuted this season, bringing the total of galleries participating in the annual event to 48 dealers. Modern and contemporary Asian art is currently enjoying popularity, and many — but not all — galleries reflect this collecting trend, but for those who prefer traditional, historic works of art, the auction houses presented breadth and depth alike. This iteration of Asia Week also saw greater representation in Japanese works of art than in previous years. Christie’s, Sotheby’s, Bonhams and Doyle continue to schedule their Asian art sales to coincide with Asia Week; this was the first year Heritage Auctions was conducting sales of Asian art and antiques. Lark Mason Associates, which sells on the iGavel platform, had a small preview open for a sale that would close in mid-April. 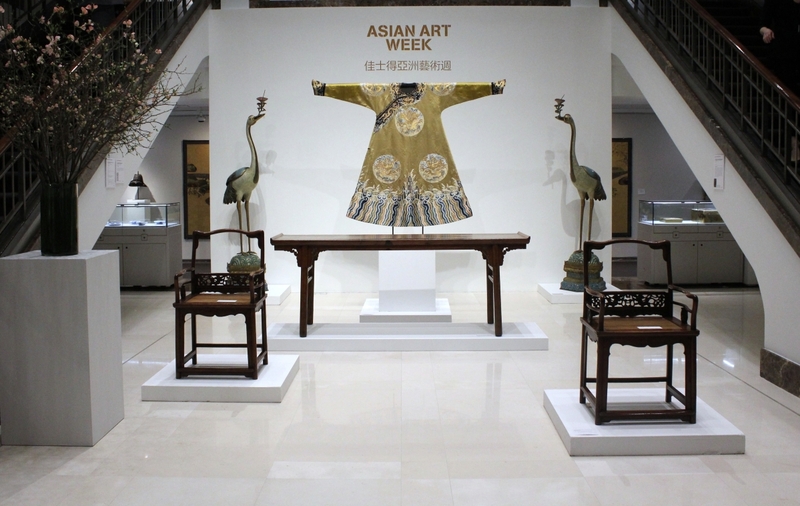 Following are but a brief glimpse at some of the galleries participating in Asia Week 2019. One of the galleries offering traditional Chinese works of art was R.M. Chait Galleries. 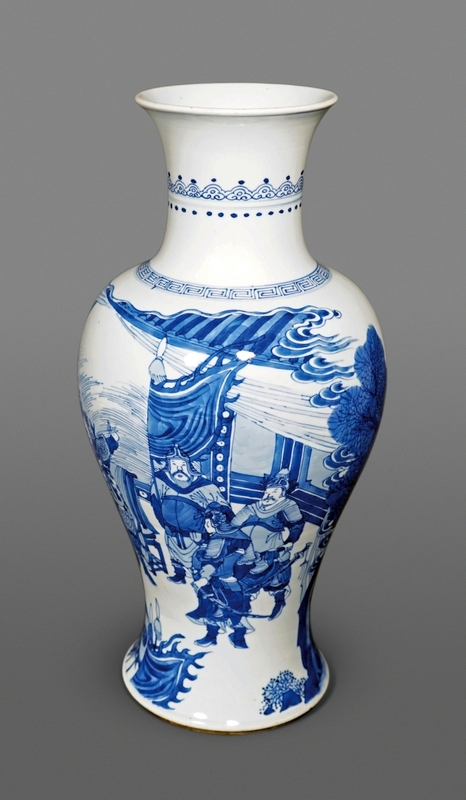 Representing the finest quality in form and decoration from the Kangxi period (late Seventeenth Century), a blue and white porcelain Chinese baluster vase was a highlight of the gallery’s spring exhibition. The 18-inch-tall vase shows military figures conversing on the draped terrace of a palace, with a court lady waiting nearby. Findlay Galleries represents the estate of Vietnamese artist, Le Pho, and for Asia Week New York 2019 mounted an exhibition titled, “Le Pho: A Retrospective.” One of the more alluring works in the exhibition is his 1983 painting “Les Tulipes Jaunes,” Le Pho depicts a typical scene from his Findlay period, which started in 1964 and continued until his death in 2001. During this period, the artist was exclusively represented by the gallery and adopted a much brighter color palette. 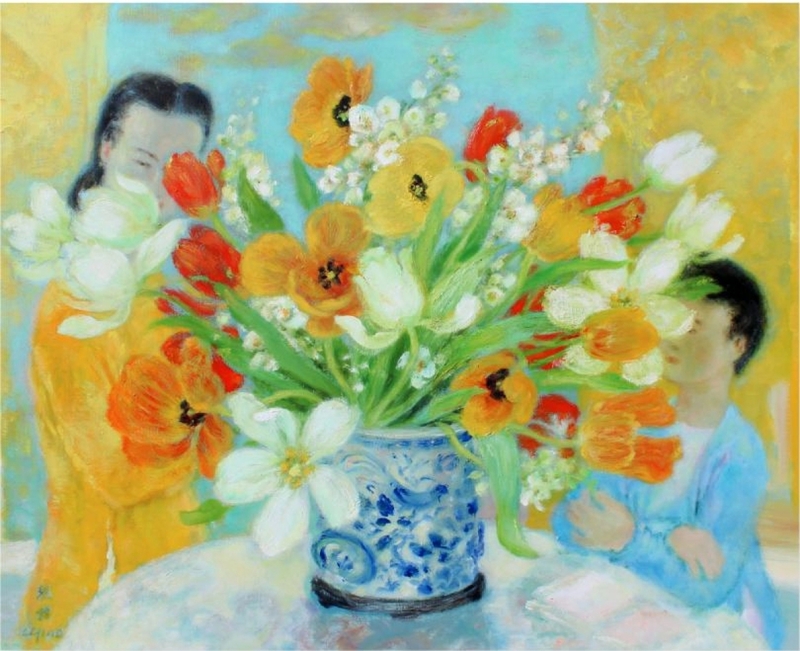 This oil painting features two figures at a table admiring a lush bouquet of vibrant flowers in a traditional blue and white Chinese porcelain vase. “Alexander Gorlizki: Indian Miniatures with a Contemporary Twist” is the title of the exhibition that Cora Ginsburg, LLC has given life to. An intriguing example is “The Interview Panel,” a 2019 work by Gorlizki in pigment and gold on a vintage photograph. Other parts of the photograph have been over-painted with the very finest miniature painting techniques. 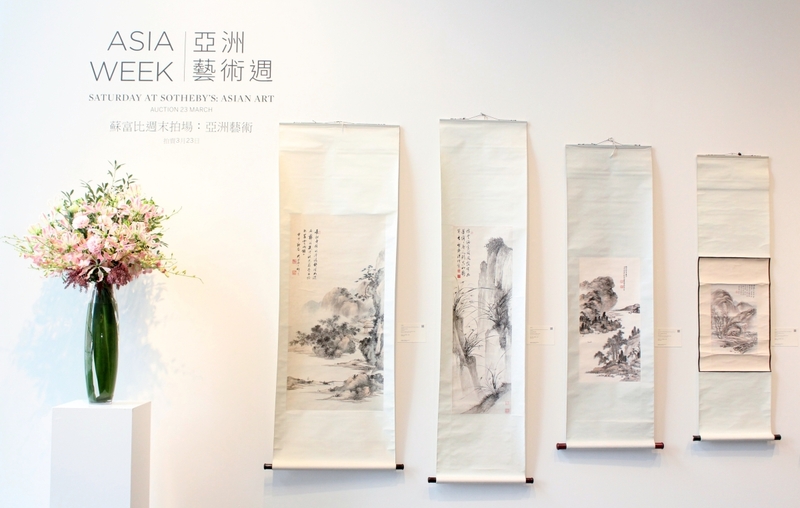 Making its debut at Asia Week New York, Beijing’s INK Studio shared space at J.J. Lally, Inc, and featured the work of four contemporary ink artists who are themselves connoisseurs and collectors of art and who reference the literati of the Song, Yuan, Ming and Qing dynasties. 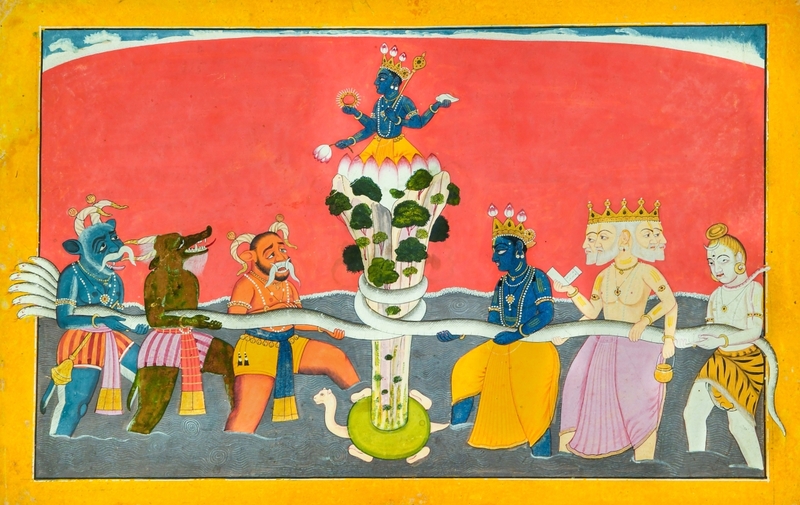 “The Kurma Avatar: Samudra Manthan (The Churning of the Ocean), Folio from the Gita Govinda” by the artist Manaku of Guler is one of the main highlights at Kapoor Galleries in its exhibition, “Arcane Masters: A Curated Exhibition of Indian and Himalayan Art.” In this trinity, the painter makes a statement about all the gods assembled to perform the task necessary for the recovery of Amrita, the nectar of immortality, from the depths of the ocean; likewise, the host of the demons is condensed here into three rather comic-looking demons. 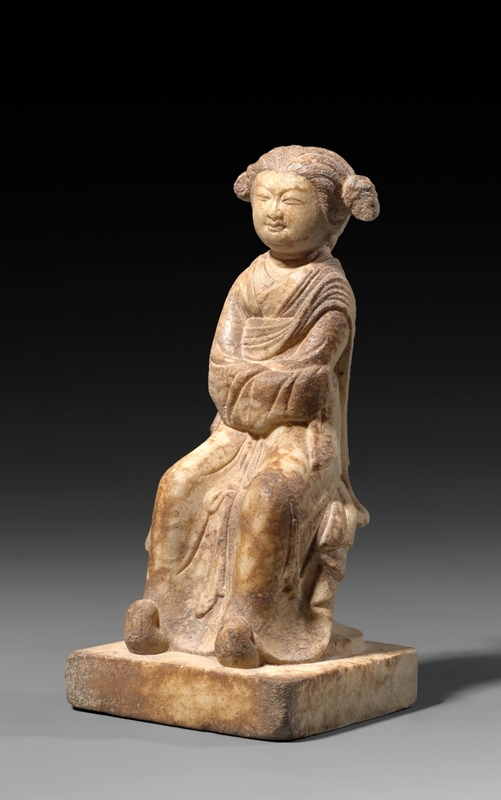 In “Chinese Art: The Szekeres Collection,” the exhibition at J.J. Lally & Co., one of the highlights is a white marble sculpture of a demure young courtesan seated on an hourglass shaped stool. It is a rare and beautiful image carved in the Tang dynasty (618–907), as part of the eternal retinue for a royal burial. 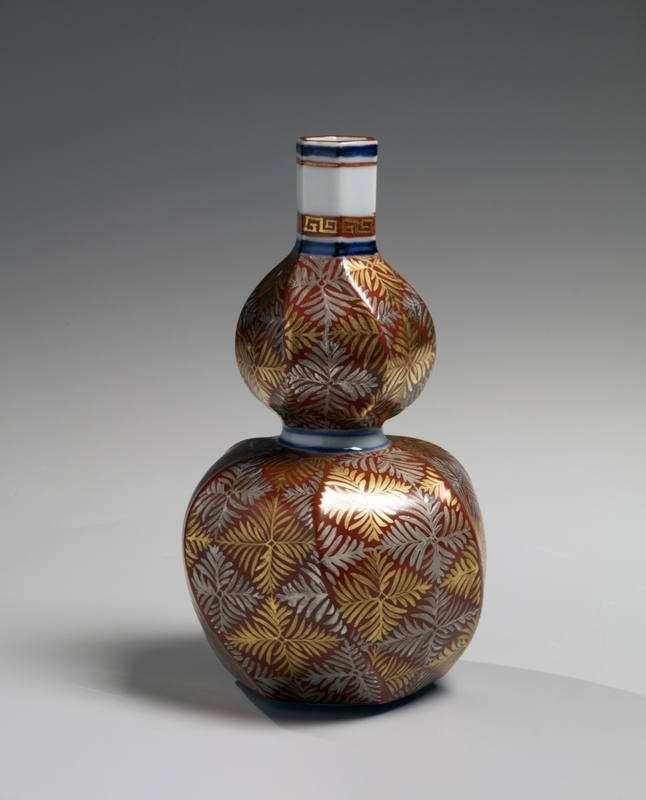 A gourd-shaped sake flask with its distinctive four-petal fern pattern created around 1960 is the focal point of “Tomimoto Kenkichi and His Enduring Legacy,” the exhibition presented at Joan B. Mirviss, Ltd. This diminutive masterpiece exemplifies the epitome of Tomimoto Kenkichi’s (1886–1963) oeuvre and was, in fact, this celebrated glaze-patterning that led to the artist’s designation in 1955 as Japan’s first Living National Treasure for porcelain. 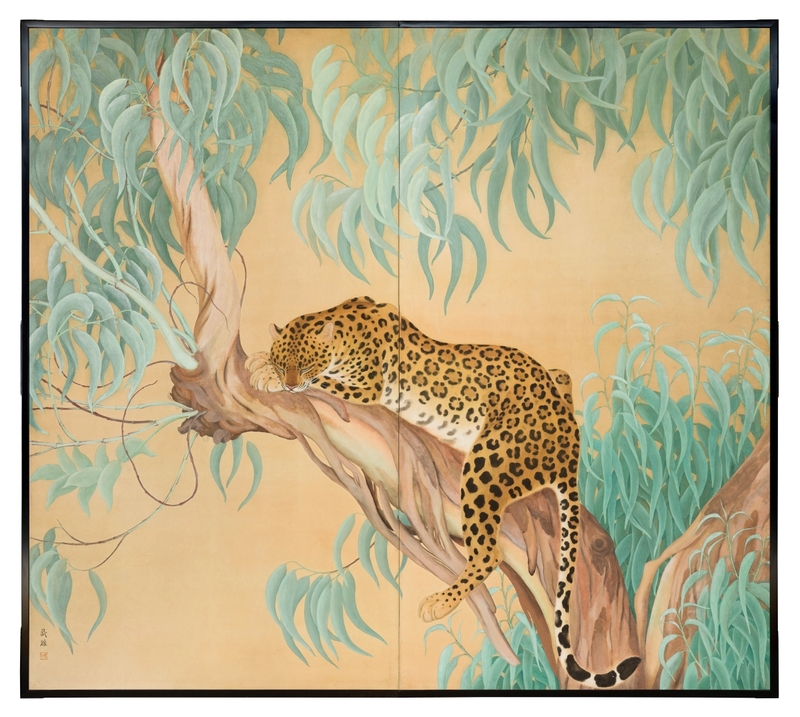 A recent acquisition, and one of the highlights of “Taisho Era Screens and Scrolls,” presented by Erik Thomsen Gallery, is “Leopard” by Takeo Taruno (b 1900). The two-panel folding screen, ink, mineral colors and gold wash on paper was executed when Taruno was only 19 years old and was exhibited in the 1919 national art exhibition in Tokyo. Leading Freeman’s Asian Art sale was this Chinese carved pale celadon jade ruyi scepter, Qianlong period, measuring 14 ½ inches in length, that realized $81,250 ($3/5,000). PHILADELPHIA — On March 12, Freeman’s conducted its Asian Arts and Japanese Works of Art auctions, both of which saw spirited bidding throughout the sales, coming from online, phone bidders, and in the room, and representing a wide array of international collectors. The combined sales totaled $1,001,579. Of particular note was a Chinese carved pale celadon jade ruyi scepter from the former collection of Francis Edward Searles (1841–1920), which sold for $81,250, far outperforming its estimate of $3/5,000. Another ruyi scepter, this one gilt bronze and cloisonné from the same collection, more than doubled its low estimate, selling for $19,500. 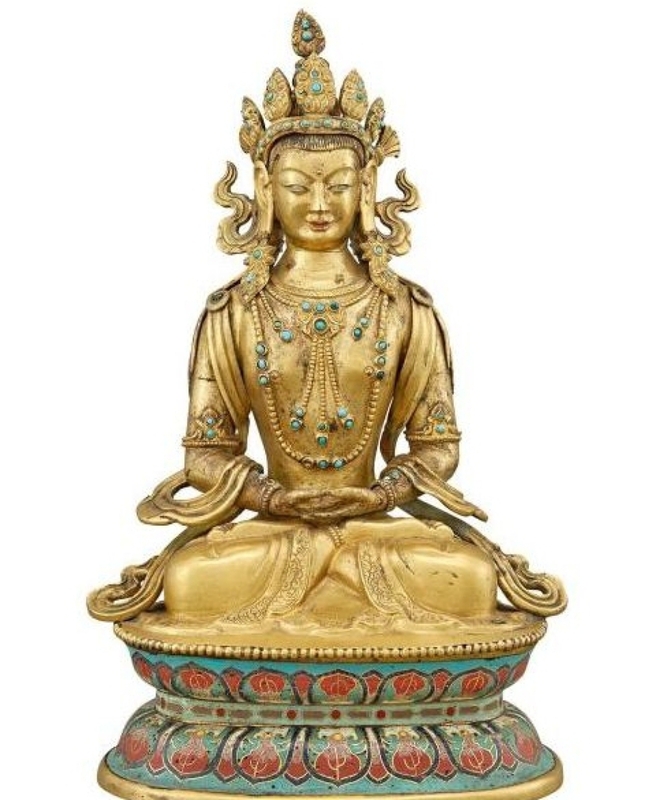 Also from Searles’ former collection was a Sino-Tibetan embellished gilt-bronze figure of White Tara that soared above its $3/5,000 estimate to garner $16,250. Porcelains and ceramics performed quite well in this auction. For example, a Chinese porcelain blue and white figure of Guanyin depicted in a hooded butterfly and floral robe, sold for more than 20 times its original estimate of $800–$1,200, ultimately achieving $20,000. Among many early ceramic sculptures, a fine example of a Tang dynasty, Sancai-glazed camel from the collection of Jeffrey Kaplan, sold for $9,750. Other highlights were several lots from a private Pennsylvania collection, including a pair of blue and white porcelain “Qinlin and Foreign Attendants” dishes that sold for $20,000 and a rare Chinese blue and white porcelain warming bowl from the Ming dynasty, that closed at $15,000. Finally, a Chinese yellow-glazed porcelain bowl with Kangxi mark, probably of the period, and a work which likely would have graced the Emperor’s table, sold for an impressive $18,125. Other media also performed quite well in the Asian Arts sale. Namely, a Ming dynasty gilt-bronze figure of Budai (lot 83) that realized $16,250 and a pair of Chinese hardwood spindle back armchairs (lot 188) that sold for $15,000. Additionally, an elegant and delicate Chinese scroll painting (lot 332) sold for more than ten times its estimate, earning $11,250. The Japanese Arts sale saw several dramatic results, several of which were lots from the aforementioned private Pennsylvania collection. 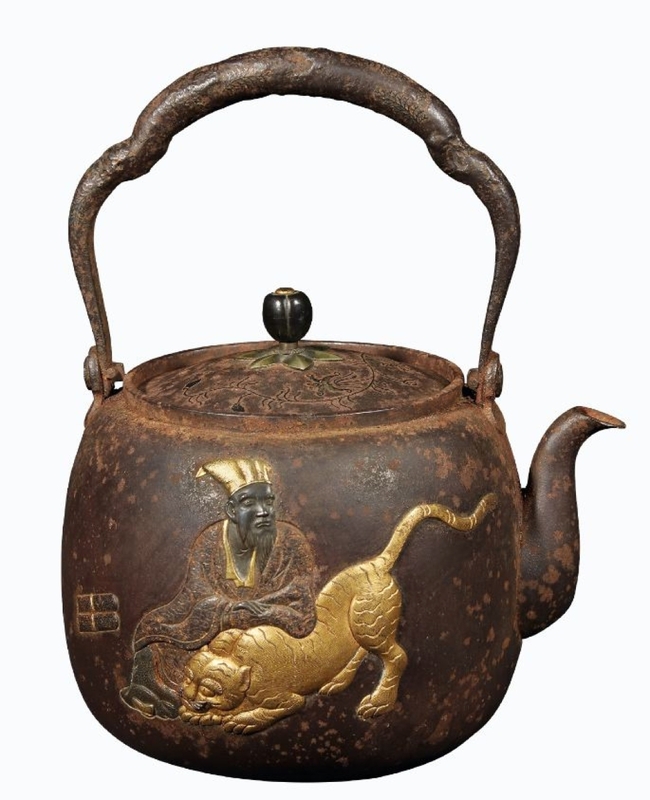 Included in these was a Japanese gold and patinated metal inlaid tea kettle, which greatly surpassed its estimate of $1/1,500 to sell for $20,000. From the same collection, a silver and parcel-gilt figure of Kannon realized $5,313, more than doubling its original estimate. 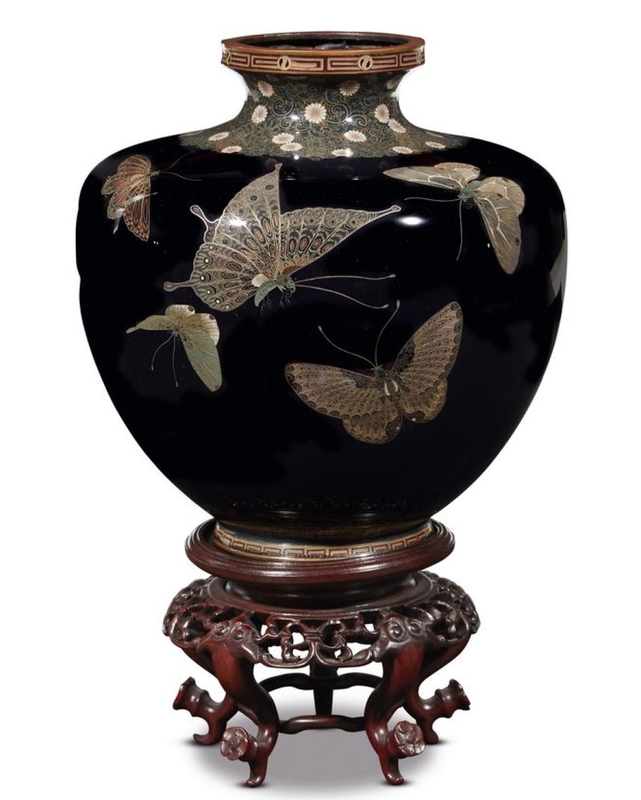 Highlights from the decorative arts and cloisonné section of the sale included a finely decorated cloisonne Butterflies vase from the Meiji period, from the collection of Duane Lease, which achieved $9,375. Freeman’s is at 1808 Chestnut Street. For more information, www.freemansauction.com or 215-563-9275. Set of eight Chinese gilt-bronze Bodhisattva, each 4¾ inches tall, brought $75,000 ($6/8,000). NEW YORK CITY — Scheduled during Asia Week New York, Doyle’s Asian Works of Art auction on March 18 presented the arts of China, Japan and Southeast Asia from the Neolithic period through the Twentieth Century. Offerings included porcelain, pottery, jade, snuff bottles, scholar’s objects, bronzes, screens, furniture and paintings. With competitive international bidding in the saleroom, on the telephones and via the internet, the auction totaled a successful $875,781, near the high end of the estimate range of $623,800/928,600, with 70 percent sold by lot and 87 percent sold by value. Figures of Bodhisattvas figured in two of the top three lots in the sale, underscoring collector interest in figural sculpture. 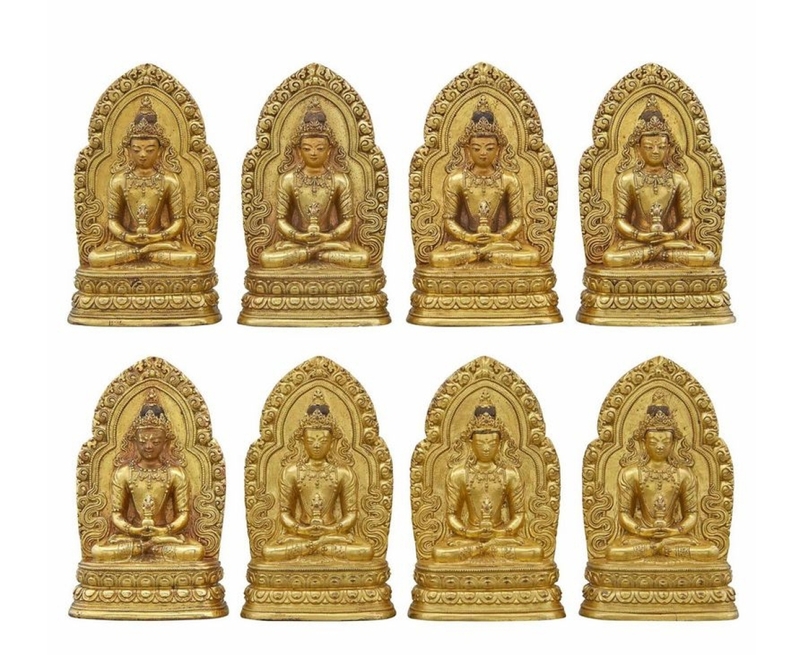 Highlighting the sale was a set of eight Chinese gilt-bronze figures of Bodhisattva, each posed seated in dhyanasana on a lotus base before a flame bordered nimbus. The set soared past their estimate of $6/8,000 to achieve $75,000. Assembled in a span of 40 years beginning in the late 1960s, this remarkable collection reflects the personal and sophisticated taste of a true connoisseur. A highly educated and respected professional in clinical research, the collector was also a lifelong classical musician who played the piano and harpsichord for relaxation. His collection was acquired through purchases from E&J Frankel, Ltd and other dealers of Asian art. Highlighting the collection is a group of Buddhist gilt-bronze sculptures dating from the Seventeenth through the Twentieth Centuries. An artistic tradition used mostly for religious purposes, Buddhist sculpture is highly prized for its beauty and historic significance. Symbolizing fidelity and happy unions, one of the leading lots from this collection was a duck-form gilt-bronze censer that depicted the bird standing in water, which sold for $22,500, more than doubling its estimate of $8/10,000. When in use, smoke emits from both its open beak and a coin-shaped aperture at its rear, representing wealth and prosperity. 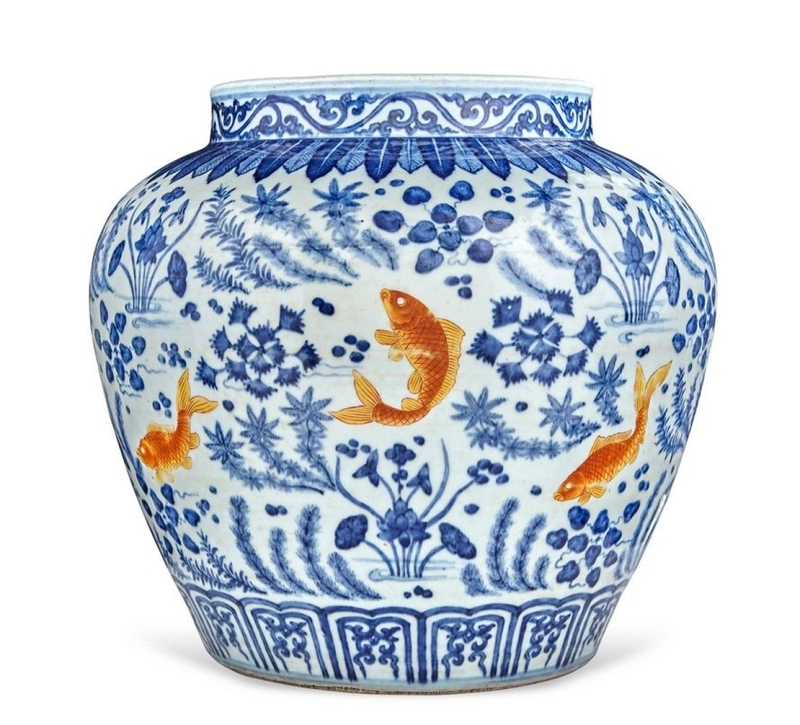 Topping the offerings of Chinese porcelains from a private New York collection was a rare underglazed blue and iron-red fish jar, a Kangxi or Yongzheng period version of a type seen in the Ming dynasty. Depicting eight swimming carp, a traditional Chinese symbol of strength and perseverance, the finely potted jar more than doubled its estimate of $20/30,000 to realize $62,500. The selection of Chinese snuff bottles offered more than 70 examples from the Kaufman collection and the Mary Ann Bresee collection. The offerings represent a wide variety of forms and materials, including carved agate, carnelian, rock crystal, amber and jade; colorful enamel; glazed porcelain and inside painted crystal. Highlighting the snuff bottles was a group of four examples from the estate of Mary Ann Bresee that fetched $22,500, far surpassing its estimate of $800–$1,200. Doyle is at 175 East 87th Street. For additional information, www.doyle.com or 212-427-2730. Leading the sale, and setting a new record for the artist in the process, was “Pomegranates in Bamboo Basket” by Dr Yuhua Shouzhi Wang, which brought $1,498,600 ($1/1.5 million). 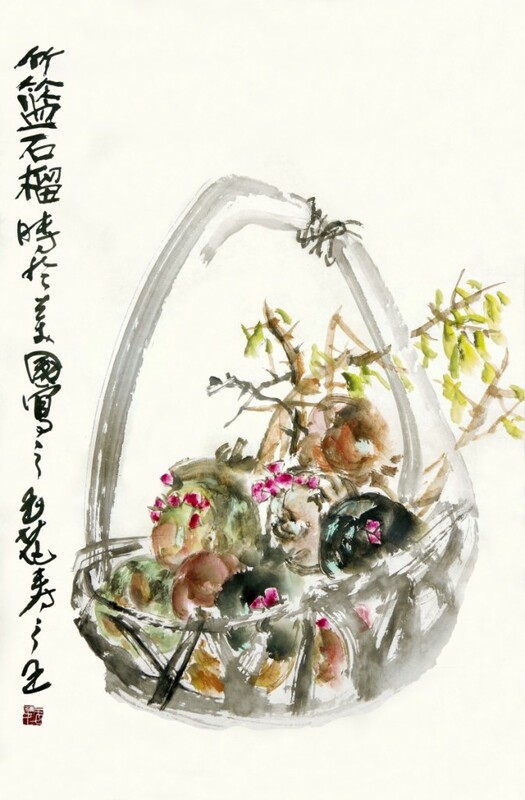 NEW YORK CITY — On Monday, March 18, Dr Yuhua Shouzhi Wang’s “Pomegranates in Bamboo Basket” achieved $1,498,600 at Gianguan Auctions. The sale, to one of four bidders in the gallery, set a world record price for the Chinese contemporary artist and the painting led a strong slate of traditional art, porcelains and carved jades. Wang’s framed ink and color on paper, measuring 27 by 18 inches, has been called a blending of “realism” and “rejection-of-perspective painting” by Professor Stephen Fasin of the Royal Academy of Arts. Its immediate charm lies in the fluidity of line that delivers a naturalistic composition of fruit and green branches as contrast to a monochromatic basket with handle. The work is inscribed “Pomegranates” and has one artist seal. It was painted in the United States. Wang, formerly a professor at the Humanities College of Auburn University, is currently acting curator at the American Museum of International Art in San Francisco, where her works reside in the permanent collection. Other headliners of the sale include “Bamboo Groove” (Birthday Offerings) by Zheng Xie (Banqiao) (1693–1765). 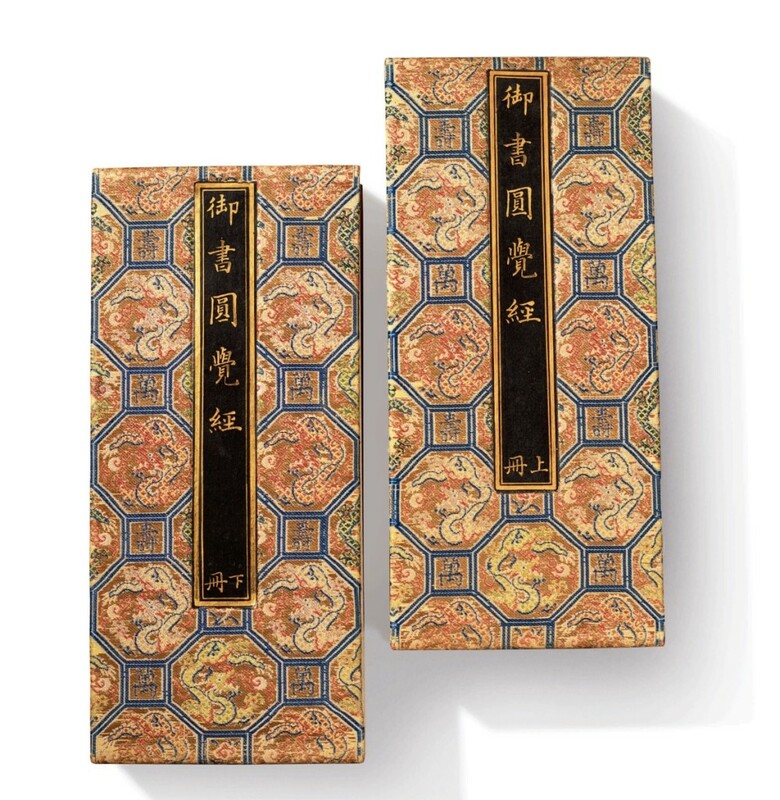 The scroll painting with two artist seals, dated 1756, and signed Banqiao Zheng Xie, proves the ongoing strength of Qing Dynasty aesthetics at $76,700. Meanwhile a modern work titled “Shrimps” by Qi Baishi (1864–1957) made $70,800. The naturalistic painting of seven free swimmers epitomizes the artist’s light-heartedness that modernized the gongbi style of classical Chinese painting. A startling work by Wu Changshuo (1844–1927) that set “Peony and Narcissus” atop and at the foot of rockery achieved $50,150. 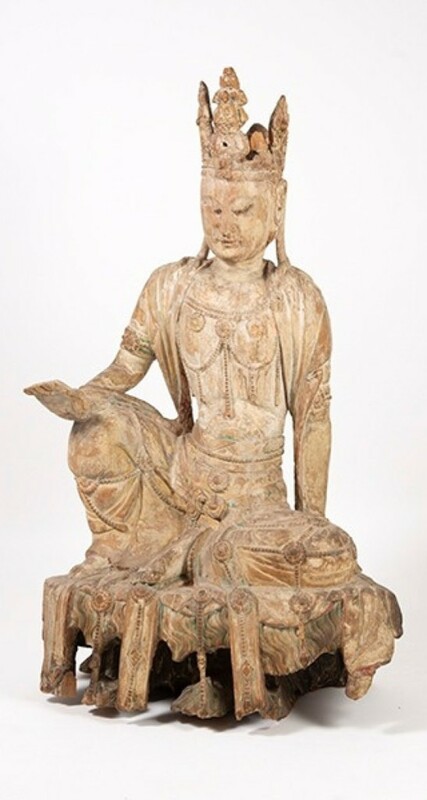 Among the Buddhist art, a rare seated Guanyin by He Chaozong, the Ming potter renowned for working in the style of the Dehua kilns, brought $47,200. 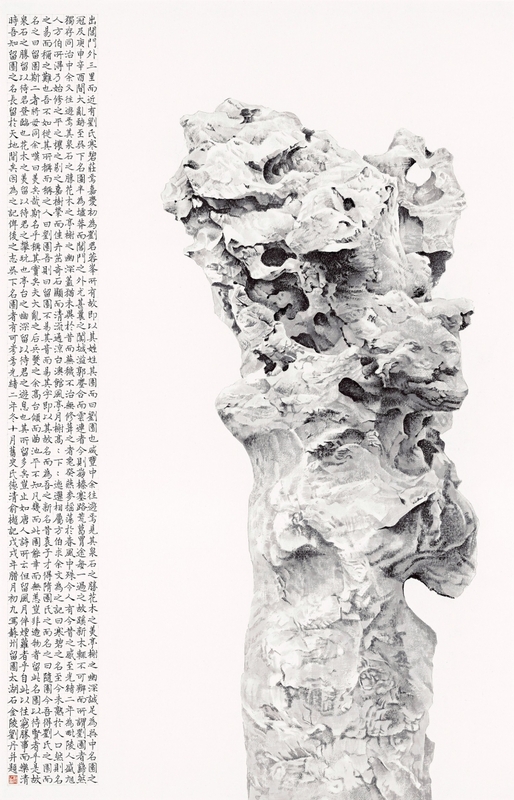 Bearing a blanc de chine glaze, the work portrays the deity in dhyanasana on a plinth of lohans and lotus blossoms. Its fingers, raised in abaya mudra, are long and delicately shaped, an indication of male energy. The eyes and smile exude the serenity of meditation. A distinctive cowl hugs the head and is seemingly unique among similar works by He Chaozong. 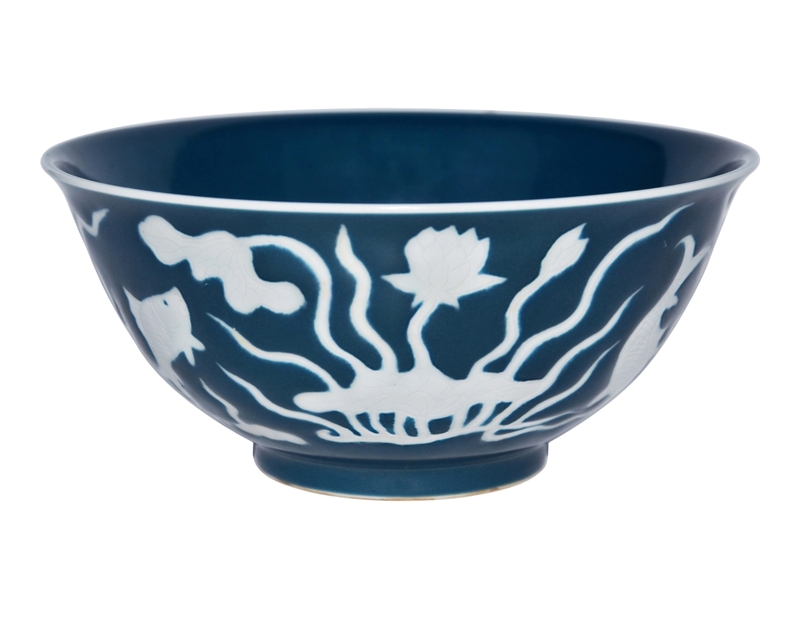 Of the decorative porcelains in the sale, a deep blue glazed bowl carved in relief with lotus pond motifs in reverse white captured buyers’ interest. The 7-inch-wide bowl with an interior center medallion of a boldly painted lotus bouquet and an exterior of fish swimming among fluttering aquatic plants fetched $47,200. Prices, with buyer’s premium, as reported by the auction house. Gianguan Auctions’ next scheduled sale will take place in June. Gianguan Auctions is at 39 West 56th Street. For information, 212-867-7288 or www.gianguanauctions.com. 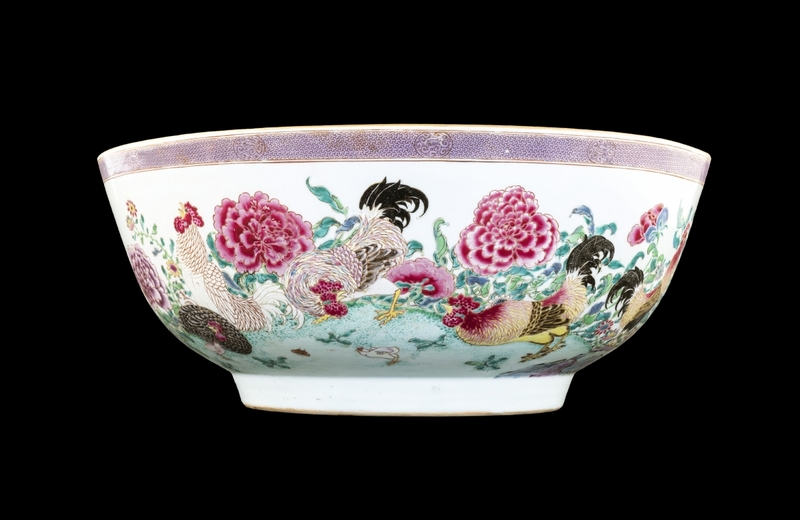 The highest selling lot at Bonhams Asia Week — and the top lot in the Chinese Works of Art sale — was this exceptionally rare pair of imperial famille rose “quails and chrysanthemums” bowls, Yongzheng six-character marks and of the period, which sold for $1,040,075 ($300/500,000). NEW YORK CITY — Bonhams concluded its Asia Week with a total of $11 million realized between four sales conducted March 18–20. 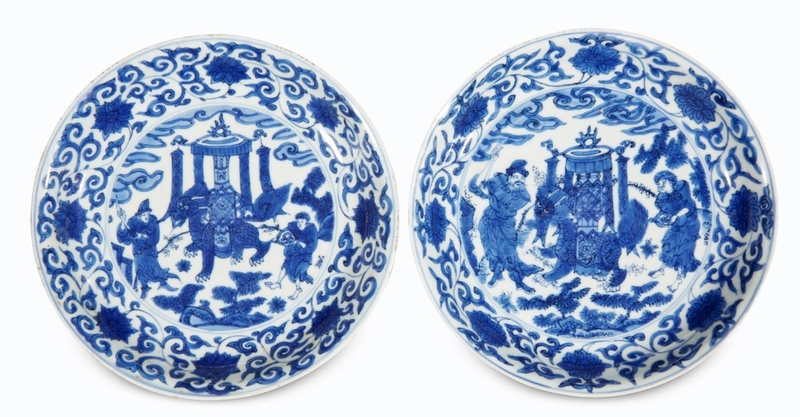 A rare pair of imperial “quail and chrysanthemum” bowls, realized $1,040,075, the top lot achieved during Bonhams Asia Week. Exceptional prices were also achieved in the sale of fine Japanese prints, including property from the collection of the late Bertram and Ruth Malenka. On March 18, Bonhams sale of Chinese Paintings and Works of Art totaled $3,874,330 and was led by an exceptionally rare pair of Yongzheng mark and period imperial famille rose bowls, which achieved $1,040,075. The bowls came from the collection of Virginia Hobart (1876–1958) of San Francisco, daughter of timber and mining magnate William S. Hobart. Additional highlights from the sale included a magnificent and massive pair of huanghuali hat chests with inlay decoration, Seventeenth/Eighteenth Century, which sold for $596,075; a rare gold commemorative bracelet, 1839–41, which made $187,575; and a rare yellow-ground green-enameled “peach and bird” bowl, Yongzheng six-character mark and of the period, which sold for $150,075. 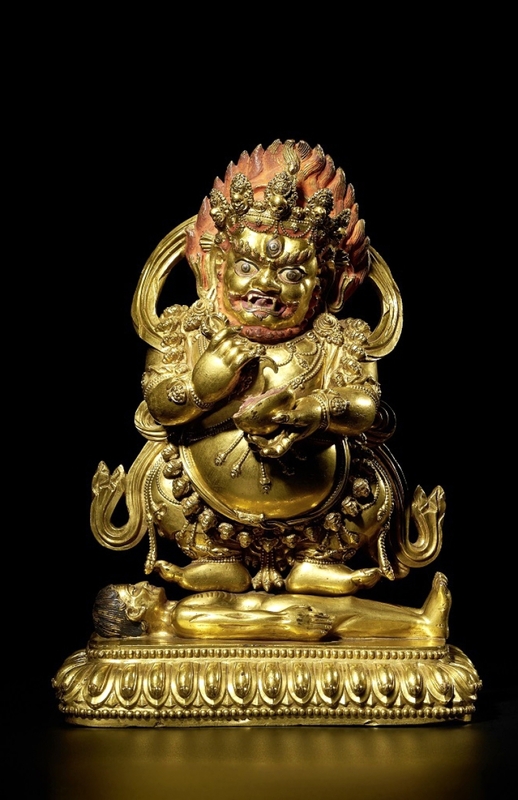 The Indian, Himalayan & Southeast Asian Art sale on March 19 totaled $4,085,996 with the leading work achieving $980,075 — a Seventeenth Century gilt-copper alloy figure of Panjaranata Mahakala, an important protector deity in Tibetan Buddhist statecraft. Other significant results were achieved by a copper alloy figure of Shiva Sukhasanamurti, South India, Vijayanagara period, Fifteenth/Sixteenth Century that sold for $106,325. On March 20, the dedicated sale of Fine Japanese Prints including property from the collection of the late Bertram and Ruth Malenka totaled $1,903,404 and was 99 percent sold, the result of exceptional works with excellent provenance. 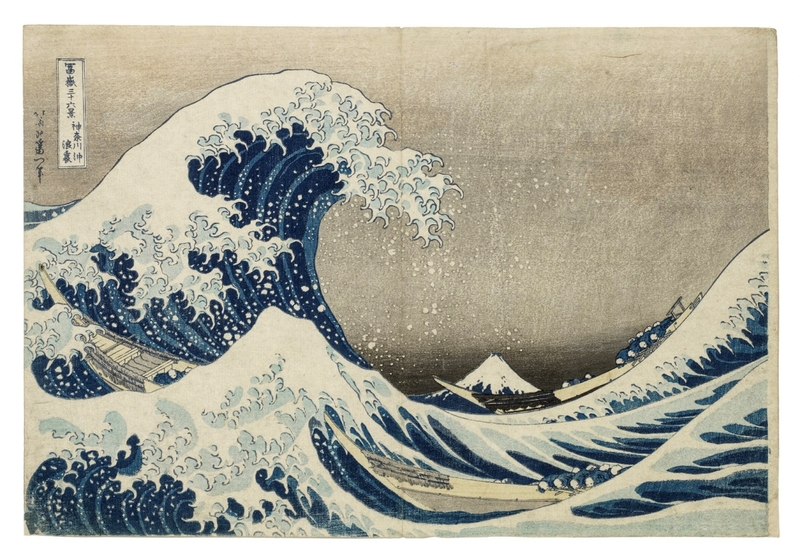 The top lot of the sale was Katsushika Hokusai’s “The Great Wave,” which realized $475,075. Solid prices were also achieved for Meiji era cloisonne in the Fine Japanese and Korean Art sale, which was led by a large and important cloisonné-enamel vase and cover by Namikawa Yasuyuki, which sold for $275,075. Bonhams is at 580 Madison Avenue. For information, 212-644-9001 or www.bonhams.com. Leading the sale was “Peony, Bottle Gourds, and Loquats” by Wu Changshuo, Dingzi, 1917. It sold for $399,000. 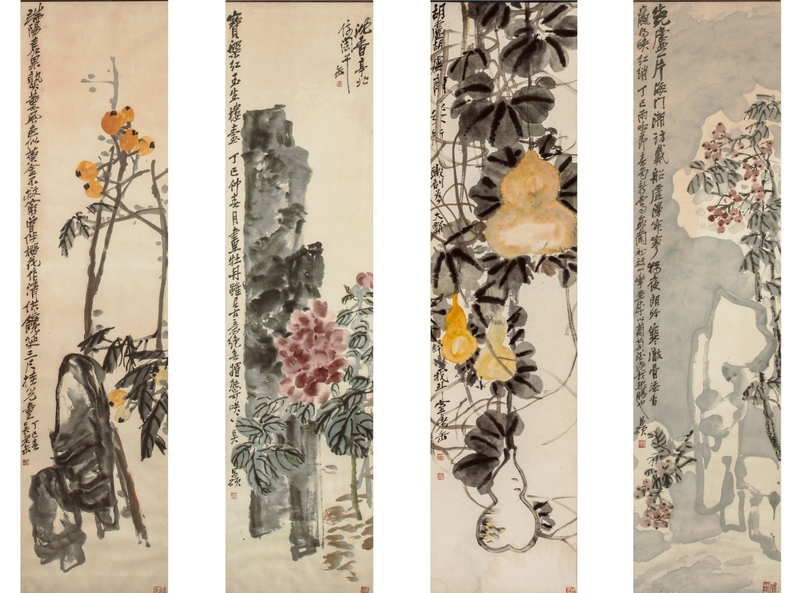 NEW YORK CITY AND DALLAS — Multiple bidders drove the price for Wu Changshuo’s “Peony, Bottle Gourds, and Loquats,” Dingzi, 1917 to $399,000 to claim top lot honors in Heritage Auctions’ Asian Art Auction in New York. The final total for the sale, Heritage’s first as a participant in Asia Week New York, climbed to $2,235,135. The four ink and color on paper works that made up the top lot enjoy strong provenance that began with a gift by the artist in 1917. 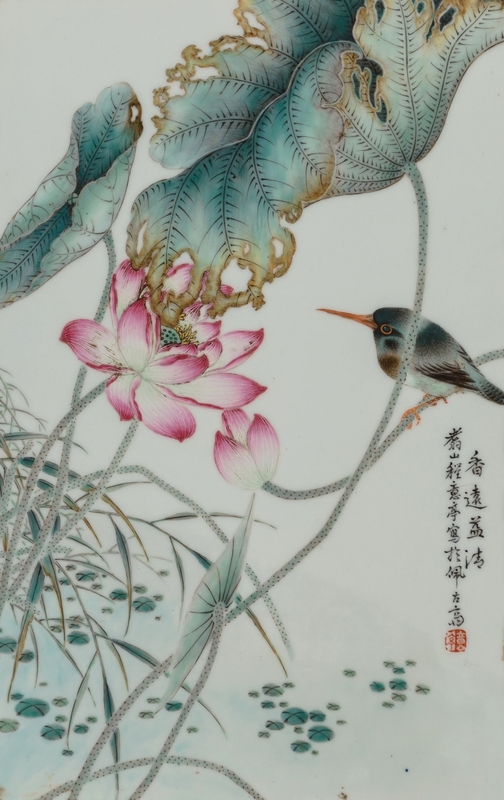 The lot is one of 23 lots in the sale from the Chenn family’s collection of fine Chinese paintings and calligraphy that brought a total of $587,275. “It is an honor to be counted among so many prestigious collectors and sellers who convene each in New York each March,” Heritage Auctions Asian art director Richard Cervantes said. “In this week, when both attendance and prices for fine Chinese and Asian works of art were up, I am proud to see Heritage Auctions’ Asian art department claim an important role among our esteemed auction peers. A Chinese lacquered and gilt-bronze figure of a seated Luohan enjoyed a massive surge of interest before closing at $87,500, well above the estimate. The 13¾-inch figurine is a Luohan, which refers to the Buddha’s immediate disciples, a group comprised of monks who have reached an advanced state of spiritual learning and have sworn to protect the Buddhist faith and its teachings until the coming of Maitreya, the Buddha of the Future. Also sparking a frenzy of competitive bids among multiple collectors was a Chinese enameled porcelain plaque, Twentieth Century, painted by a member of the famed “Eight Friends of Zhushan” group and which topped its estimate when it brought $81,250. 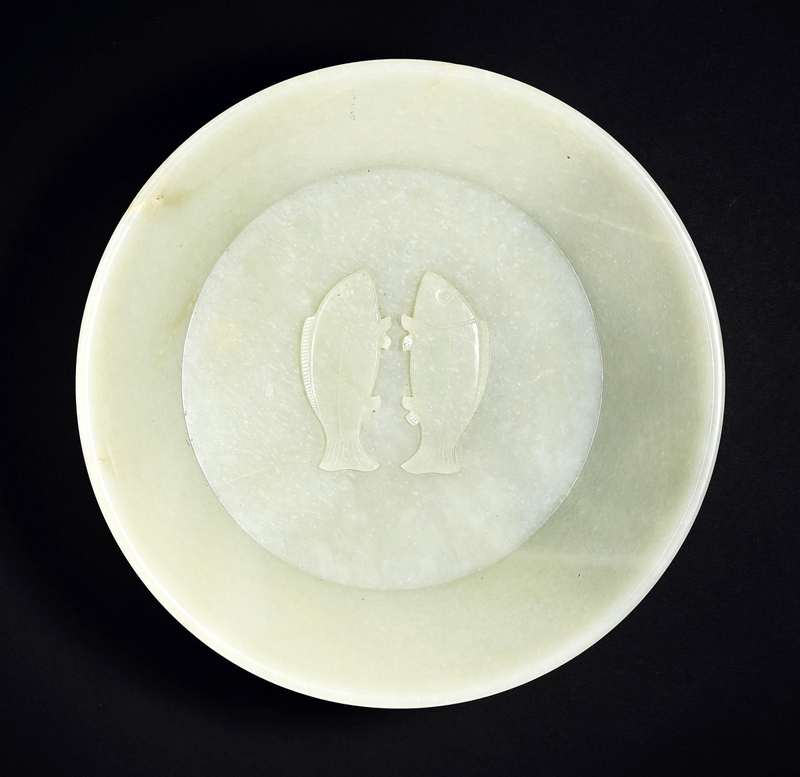 The porcelain plaque shows birds and lotus, with signature and red seal reading “Cheng Yiting” to the right. From the Ding Zhongying family collection, Zhang Daqian’s “The Three Friends of Winter,” which sold for $71,875. In ink and color on paper, it measures 53 by 17¾ inches wide, and is signed with four seals of the artist. Other top lots from the Chenn family collection included, but were not limited to: Aisin Gioro Hongli’s “The Emperor Qianlong Calligraphy after Dong Qichang (1555–1636)” that sold for $62,500; Liang Qichao, “The Stele of Zhang Qian,” early Twentieth Century that closed at $32,500; Liang Qichao’s 1916 “Calligraphies” that made $22,500; and a scroll couplet by Wu Mei that finished at $20,000. Other top lots included, but were not limited to a Chinese carved celadon jade vase with dragon figure, late Qing dynasty-early Republic period, that brought $40,000; Zhang Daqian’s “Bamboo” for $40,000; a Chinese gilt-bronze figure of seated Buddha Shakyamuni, late Ming–early Qing dynasty, Sixteenth–Seventeenth Century that realized $35,000; Liang Qichao’s “The Stele of Zhang Qian,” early Twentieth Century that closed at $35,000; and a large Nineteenth Century Chinese archaistic carved jadeite beast-form vessel and cover, Qing dynasty that went out at $30,000. Heritage Auctions in New York is at 445 Park Avenue. For information, 212-486-3500 or www.ha.com. An exceedingly rare and important complete set of the Sutra of Perfect Enlightenment, by the Qianlong emperor, dated to 1746, finished at $2,660,000. NEW YORK CITY — After a marathon of auction previews and sales, Sotheby’s wrapped up Asia Week New York with eight sales seeing more than 800 lots sell for a cumulative total of $45.7 million, including five works that achieved prices in excess of $2 million. The sales met the overall high expectations for the series. 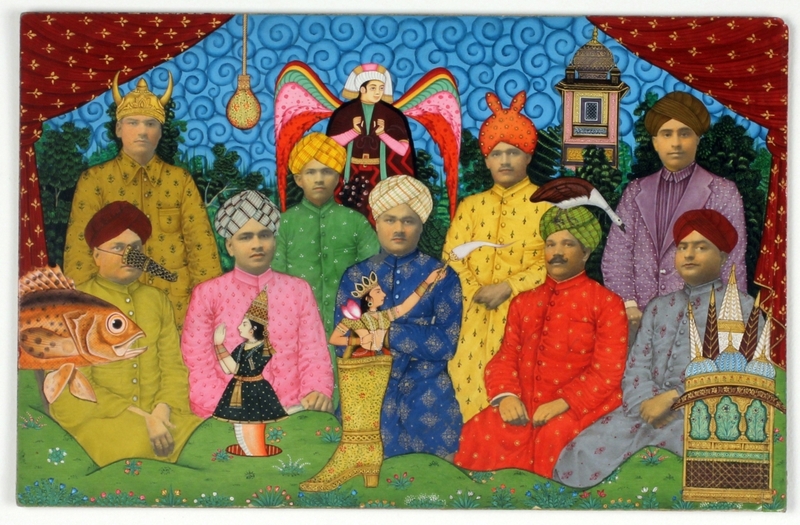 Kicking off the sales were nearly 100 lots of Modern & Contemporary South Asian Art on March 18 that totaled $3,019,375 and was nearly 80 percent sold by lot. The top lot in the sale was “Golgotha in Goa” by FN Souza, which almost doubled expectations when an institution bought it for $437,500 ($250/350,000). Starting the sales on Tuesday, March 19 was the collection of Stephen Junkunc III, a small selection of 44 lots that spanned Chinese antiquity, dating from the Neolithic to the Tang dynasty periods. The sale realized $4,138,125, with nine of the top ten lots going to private collectors and 77 percent of the sale selling. A Han dynasty beige jade carving of a mythical beast made $740,000, more than twice its estimate ($300/500,000). After the Junkunc collection concluded, the Robert Youngman 65-lot collection of Chinese jade was offered. The collection was particularly desirable to Asian trade buyers, who prevailed in eight of the top ten lots, including the top lot, a Ming dynasty yellow and russet jade figure of Zhou Yanzi that nearly quadrupled its low estimate ($40/60,000) to close at $150,000. Nearly 70 percent of the sale sold for a total of $1,036,625. Late that day, Part II of the Jie Rui Tang collection of Kangxi porcelains crossed the block, with 73 percent of the 64 lots selling. Taking top honors at $572,000 was a Qing dynasty, Kangxi period large inscribed famille verte brushpot that soared past its estimate ($80/120,000). The sale would total $2,237,000, with private collectors in Asia and Europe being the predominant winning bidders of the top ten lots. The marquee event was the Important Chinese Art sale on March 20, which saw all three of the top lots each sell for more than $2 million and purchased by private Asian collectors. The sale raked in $19.1 million but was only 64 percent sold. The top lots included a rare and complete set of the Sutra of Perfect Enlightenment, which was inscribed by the Qianlong emperor himself that made $2,660,000 ($300/500,000), while a Qing dynasty white jade “Imperial Procession” brushpot from a group of Chinese jades sold by the Art Institute of Chicago realized $2,060,000 ($800/1.2 million). Rounding out the top three lots was a late Tang dynasty gilt-bronze figure of Cintamanicakra Avalokiteshvara that had been discovered on the Antiques Roadshow soared past its estimate ($60/80,000) to finish at $2,060,000. Angela McAteer, Sotheby’s head of the Chinese works of art department, said, “We saw great demand for works acquired by visionary American collectors…Overall, we saw strong competition for imperial works of art, with Chinese porcelain reigning supreme throughout the sales. Continuing beyond China, Sotheby’s sale of Indian, Himalayan and Southeast Asian art the morning of March 21 brought $5,166,500, with 75 percent of the 88 lots selling. 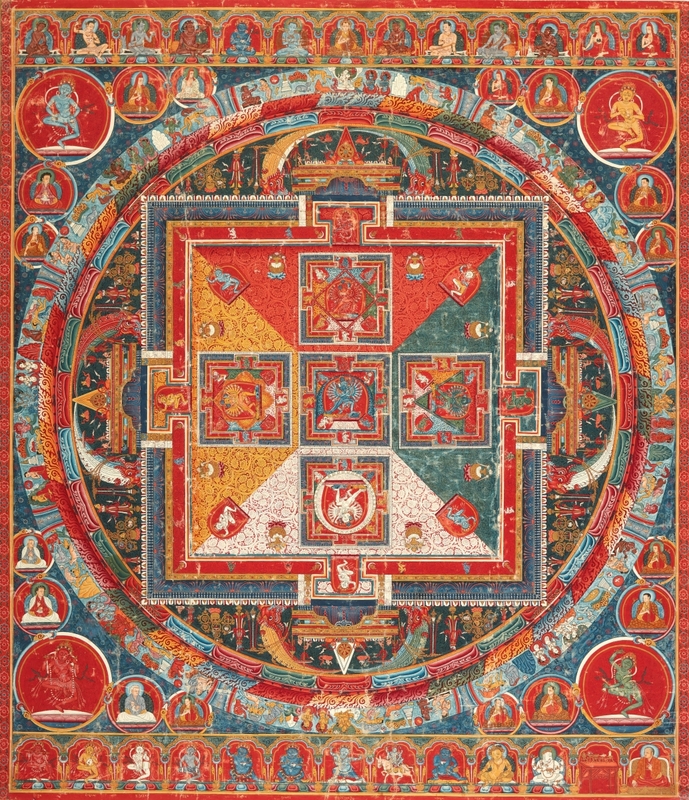 First place honors went to a Tibetan Thangka depicting a Hevajra mandala from the second half of the Fourteenth Century, which doubled its high estimate expectations ($800/1.2 million) to finish at $2,420,000. The sale of Fine Classical Chinese Paintings and Calligraphy on Friday March 22 was the penultimate sale and realized $7,262,250. A painting by Shen Zhou (1427–1509) titled “Poems on Falling Flowers in Running Script” closed at $3,020,000 ($1.2/1.8 million) and led the sale, which was nearly 74 percent sold. The books closed on Sotheby’s Asia Week offerings when an online sale of Asian Art concluded on Saturday, March 23. Nearly 400 lots crossed the block, of which 76 percent sold and achieving prices from $375 to $122,500, totaling $3,012,251. Sotheby’s is at 1334 York Avenue. For information, 212-606-7000 or www.sothebys.com. Li Dongyang’s (1447–1516) “Fourteen Poems on Planting Bamboo,” which sold to an unidentified buyer for $4,575,000, led the sale of Chinese paintings, and, additionally, was the priciest lot sold at auction during Asia Week New York 2019. NEW YORK CITY — The eight live auctions that comprised Christie’s Asian Art Week sales March 19–22 realized $79,285,375, surpassing initial estimates, and were 87 percent sold by lot. Of the lots that found buyers, 46 percent sold for more than the high estimate and 14 lots brought an excess of $1 million. Deep bidding was witnessed from Greater China across all categories, and there was active participation from registered bidders across more than 42 countries with representation from five continents. Jump-starting the slew of sales was the sale of Japanese and Korean Art on the morning of March 19. The sale totaled $5,822,125 and was 82 percent sold by lot. The sale was topped by “Gaifu kaisei (Fine wind, clear weather) ‘Red Fuji’” by Katsushika Hokusai (1760–1849), selling for more than five times its estimate ($90/120,000) to finish at $507,000. Fine Chinese paintings followed the afternoon of March 19 and realized $7,808,500. 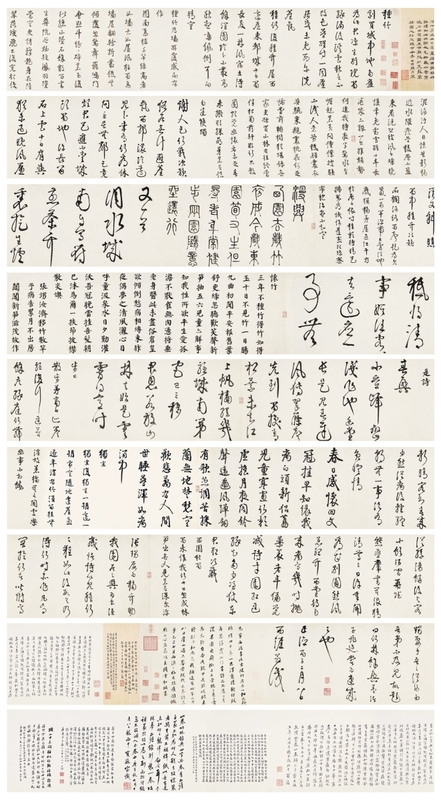 Buyers pursued Li Dongyang’s (1447–1516) “Fourteen Poems on Planting Bamboo,” which sold to an unidentified buyer for $4,575,000, more than six times its low estimate ($800/1.2 million). The sale was also the highest price achieved at any auction conducted during Asia Week New York 2019. A small but choice sale of South Asian Modern + Contemporary Art the morning of March 20 totaled $5,842,625 with 91 percent sold by lot. The top lot of sale was Maqbool Fida Husain’s (1913–2011), “Untitled (Horses),” which realized $1,035,000 ($700/900,000). Indian, Himalayan and Southeast Asian works of art were offered the afternoon of March 20, with 85 percent of the lots selling for a total of $4,671,375. The top lot of the sale was a painting of Vaishravana, Tibeto-Chinese, Eighteenth Century, which realized $447,000, more than ten times its estimate ($40/60,000). 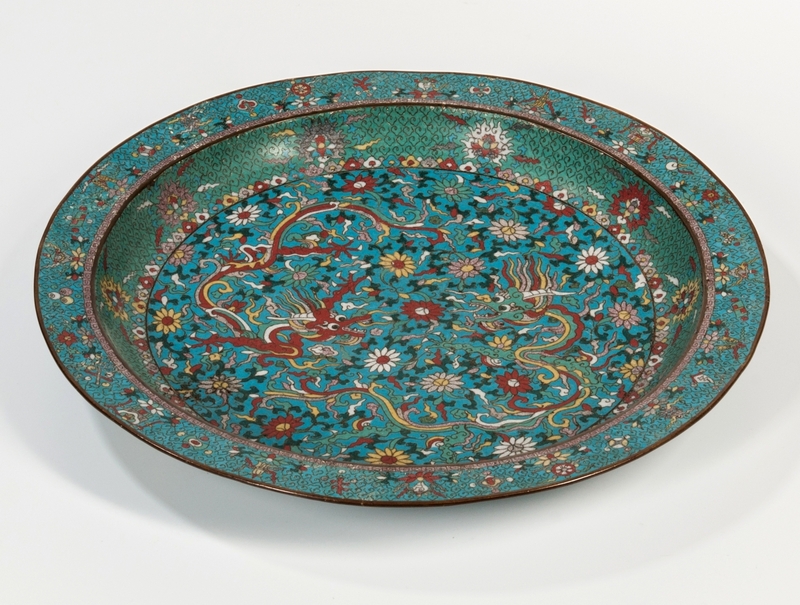 “Lacquer, Jade, Bronze, Ink” was the title given to the collection of Florence and Herbert Irving, the most important collection offered at Christie’s during Asia Week. The house divided the collection among an evening sale on March 20, a day sale March 21 and an online-only sale of contemporary ceramics that closed March 26. The evening sale of 26 lots was 96 percent sold and totaled $17,894,750, led by an imperially inscribed Qing dynasty greenish-white jade “Twin Fish” washer dated to 1786 that made $2,895,000 ($1/1.5 million). The day sale of 259 lots totaled $13,374,625 with 97 percent of lots selling. Heading the day sale was a large archaistic pale green and russet jade carving of a “pig-dragon,” which closed at $2,295,000 ($5/7,000). Friday, March 22 was the final day of live sales and got off to a good start with 11 lots of early Chinese ritual bronzes from a distinguished European collection. 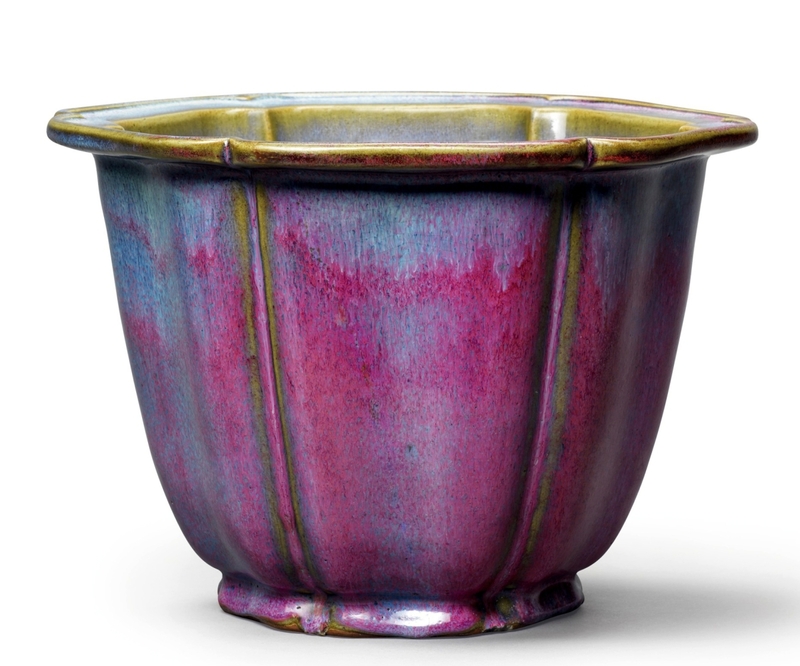 All but one of the lots found a buyer, with the top lot — a Shao Fanding bronze rectangular ritual food vessel sold for $1,095,000 ($1/1.5 million). Following this small collection was a large two-session sale of nearly 225 lots of Chinese ceramics and works of art that totaled $ 19,319,875 and was 76 percent sold, by lot. A Fourteenth-Fifteenth Century, Yuan-Ming dynasty “Number Three” Jun jardiniere led the sale, closing at $3,015,000 ($2.5/3.5 million). Christie’s is at 20 Rockefeller Center. For information, 212-636-2000 or www.christies.com. Leading the sale was this large cloisonne charger with dragons, China, early Twentieth Century, Ming dynasty style. It realized $315,000. 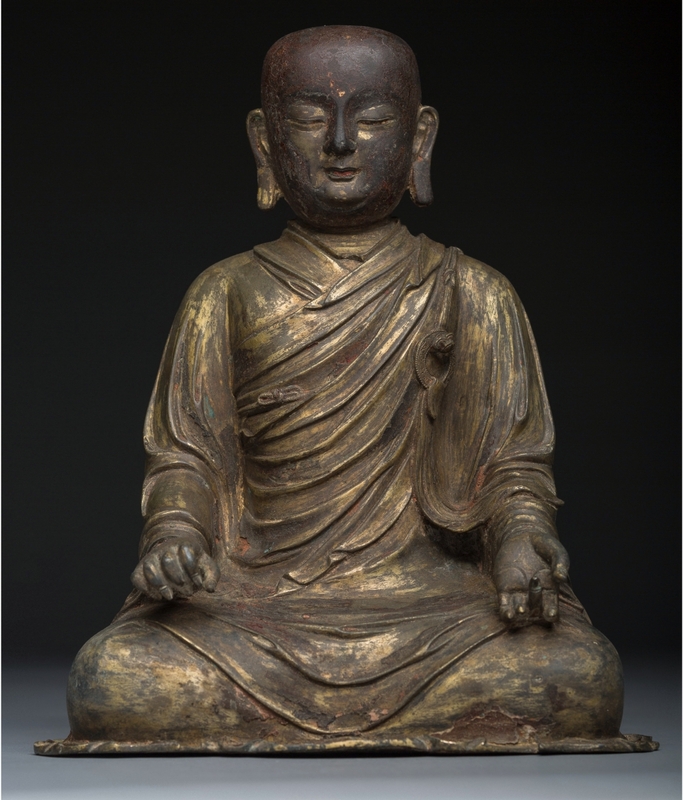 BOSTON — The Skinner March 22 Asian Works of Arts auction presented the arts of China, Japan, Korea and Southeast Asia dating from Neolithic times through the Twentieth Century. Featured were examples of Chinese monochrome ceramics, Gandharan and Sino-Tibetan Buddhist sculpture, Japanese Satsuma ware and Chinese textiles. Property from estates and collections long off the market showed their strength with many examples selling above estimate pushed by competitive bidding from international and domestic bidders in the room, on the telephones, and via live internet bidding resulting in a sale 90 percent sold by value. An email inquiry from private owners in New England led to the consignment of a Chinese cloisonne charger brought back by a family member from China in the early Twentieth Century. With decorative devices including dragons, ruyi clouds and Eight Buddhist Treasures, it bore a six-character Wanli mark. Multiple online bidders competed with the telephones to push the lot to $315,000 against an estimate of $1/1,500. An extensive collection of monochrome Chinese ceramics from a New England collector exceeded expectations as the group with its breadth of color and form appealed to collectors of every period of Chinese ceramics. 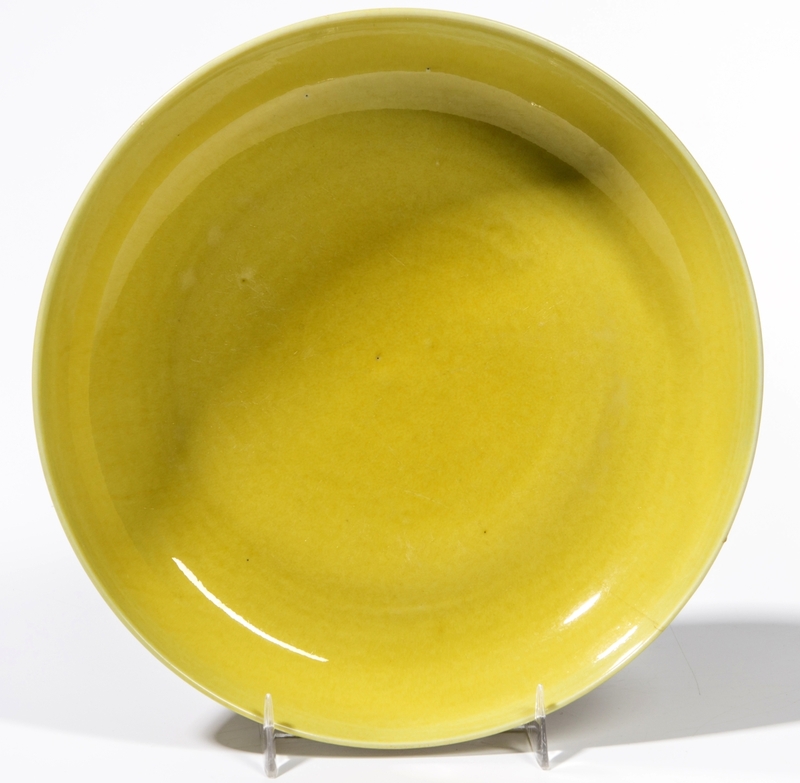 Examples ranging from an egg-yolk yellow dish, Jiajing mark and period, sold for $20,910 to a sang de boeuf bowl, six-character Qianlong mark sold for $19,680. 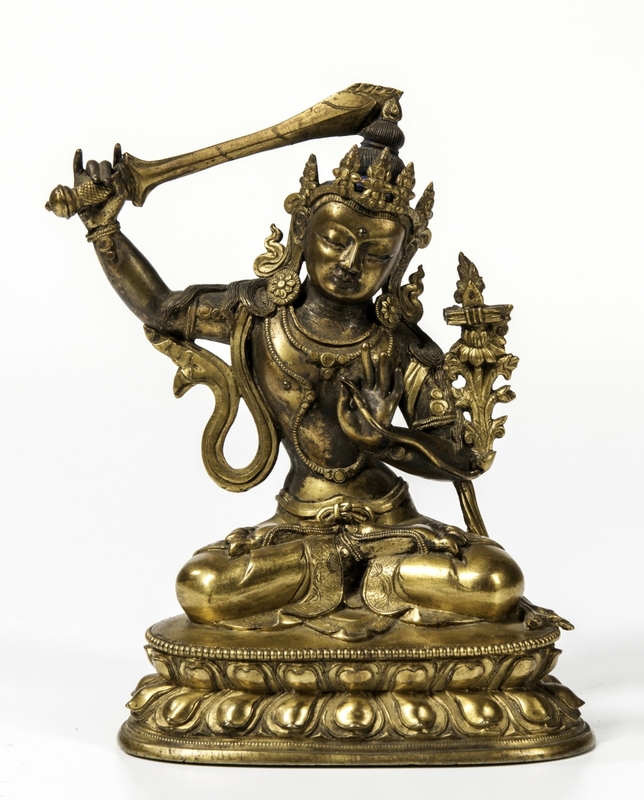 A serene bronze Manjushri sold for $18,450. It was part of a group of Sino-Tibetan bronzes collected by the current owner’s father while employed by Standard Oil in China in the 1930s. Other auction highlights included a massive famille rose enameled vase, with illustrated scenes to the panels that brought an impressive price of $43,050; a contemporary painting by Ji Dachun (b 1968), oil on canvas, China, 2001, depicting two men behind a desk with a map, against a blank background, signed “Dachun” with year “xinsi” in Chinese, sold for $18,450. Ornamental Kingfisher hairpin and earrings exceeded their $800–$1,200 estimate to fetch $8,610. A Canton enamel European-themed covered bowl, China, dating to the Eighteenth Century, and sold to benefit the Clark Art Institute, Williamstown, Mass., sold for $10,455. Skinner is currently accepting consignments for auctions. We invite consignors to take advantage of this robust market to sell Chinese, Japanese, Middle Eastern and Central Asian art, objects and furniture. Skinner is at 63 Park Plaza. For additional information, 617-350-5400 or www.skinnerinc.com. Chinese carved wood figure of Avalokiteshvara, Yuan/Ming dynasty ($150/250,000). NEW YORK CITY AND NEW BRAUNFELS, TEXAS — Lark Mason Associates Spring 2019 Asian art auctions will give collectors and enthusiasts alike a chance to view and purchase Chinese, Japanese, Korean and Indian works of art. The sale offers more than 500 lots available for online bidding through April 16 on www.igavelauctions.com. Viewing is by appointment only in Lark Mason Associates’ offices in both New York City and New Braunfels, Texas. The sale includes Indian works previously purchased at Sotheby’s, Korean porcelain, Japanese works and a wide array of Chinese art. Several important Chinese works of art highlight the sale. The first is a Chinese zitan cabinet with dragon-carved panels, dating to the Eighteenth Century. 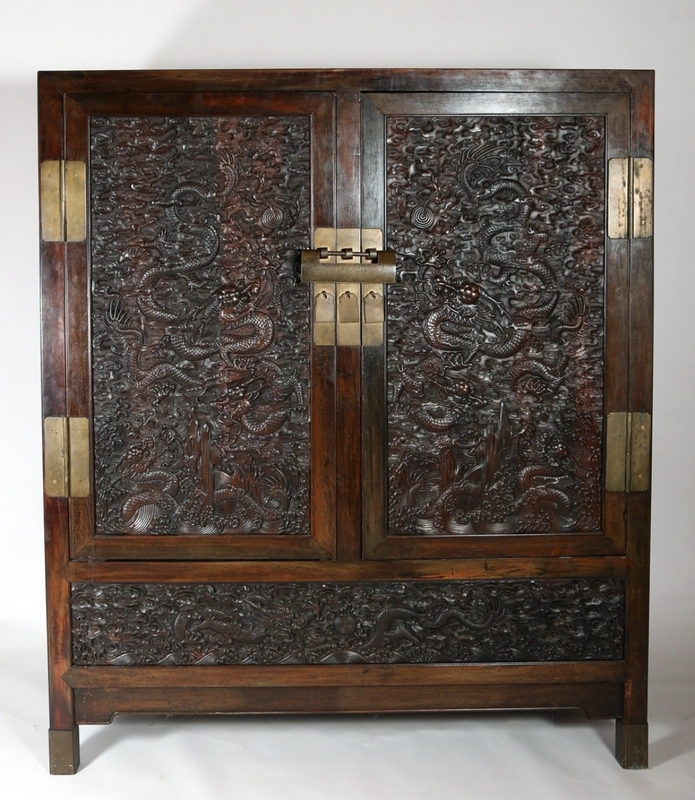 This piece, estimated at $80/120,000, is an interesting piece, with side panels and the overall construction dating to the reign of Qianlong and the doors dating to the end of the Qing dynasty. This was an imperial Chinese piece that was purchased by Miss Eliza Scidmore in Beijing in 1901. Scidmore was the sister to the American consul to Shanghai, and she lent the doors to the Smithsonian institute for four years for display. 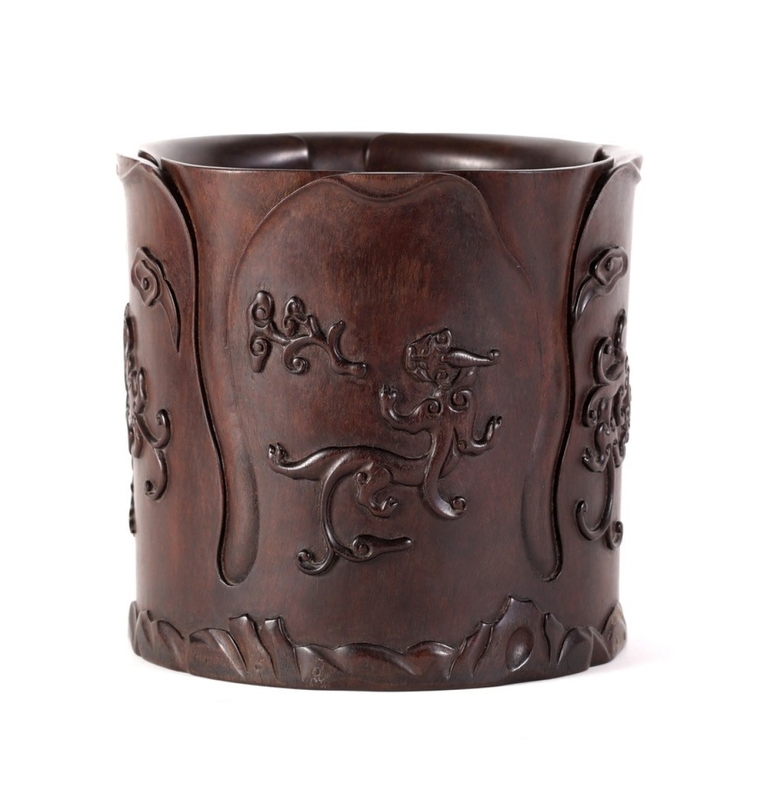 Another zitan highlight is a rare Chinese carved dragon brushpot dating to the Qianlong period that is estimated at $30/50,000. Jade offerings in the sale are led by an Eighteenth Century Chinese celadon jade Ruyi scepter estimated at $50/80,000. 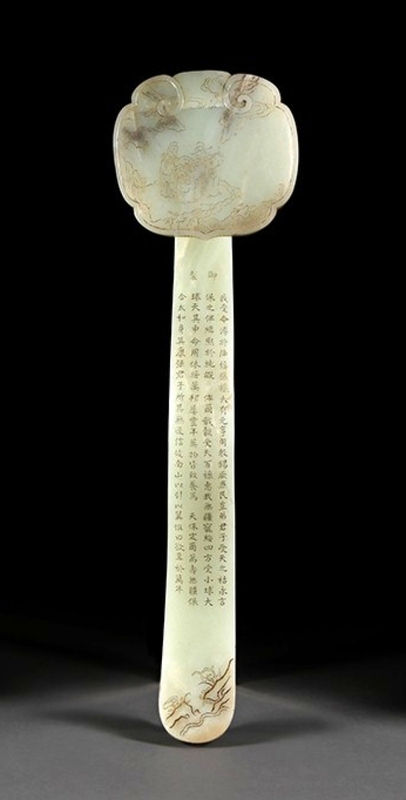 The scepter is inscribed with a poem written by the Qianlong Emperor (1736–1795). A lot combining both zitan and jade is a pair of Chinese jade and cloisonne mounted zitan and hardwood scroll form panels estimated at $40/60,000. These were purchased by a Seattle doctor, who formed his collection during the 1960s, purchasing from galleries in New York and San Francisco. Sculptural works include a Chinese carved wood figure of Avalokiteshvara, circa early Fourteenth Century. The impressive life-sized sculpture is the property of a Swiss collector and also has provenance to the Ian Woodner collection and was purchased in France in the 1960s. The estimate of this figure is $150/250,000. 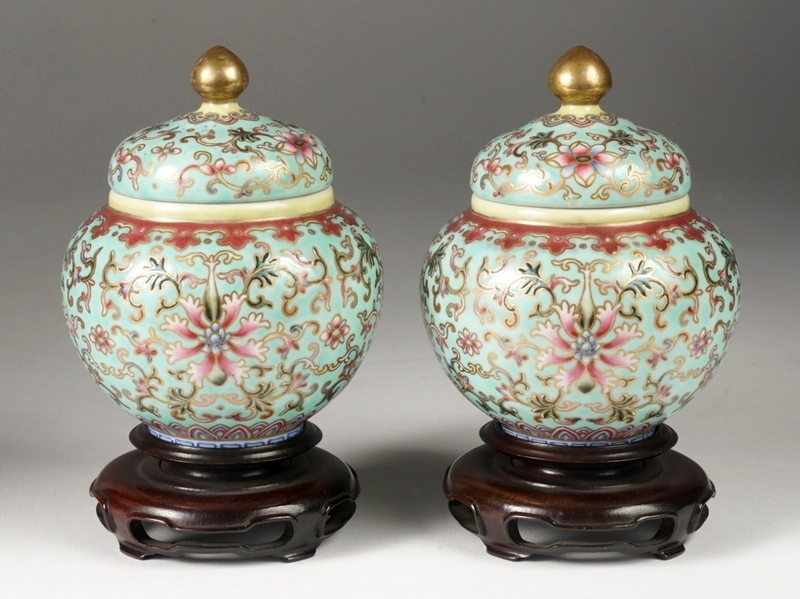 One of the leading porcelain lots is a pair of famille rose gilt and enamel decorated covered jars that bear the Qianlong mark and date to the Republic period ($40/60,000). Lark Mason Associates, selling on the iGavel online platform, is at 227 East 120th Street in New York City and 887 Cross Street in New Braunfels, Texas. For information, 212-289-5524.